After spending 4 days in Gozo, it was time to take the ferry and head back to Malta for 8 days. (The ferry is free FROM Malta to Gozo but they collect 4.75 Euro from everyone on the way TO Malta.) This turned out to be the worst weather day in a year of traveling. The rain started while we waited for the bus to get to the ferry, bucketed down on the way to the ferry and while we waited for the ferry, letting up only when we actually rode the ferry. By the time we landed at the terminal in Cirkewwa on Malta, the downpour returned! What happens to taxis when it rains? They disappear! With no taxis in sight, we huddled under the bus stop with everyone else, complete with suitcase of all sizes and shapes. Since we arranged to meet our AirBnb host at the apartment, I texted to tell him we were waiting for buses to appear. James was stuck in traffic, too, and said he’d just pick us up so “hang out”! What a great guy! 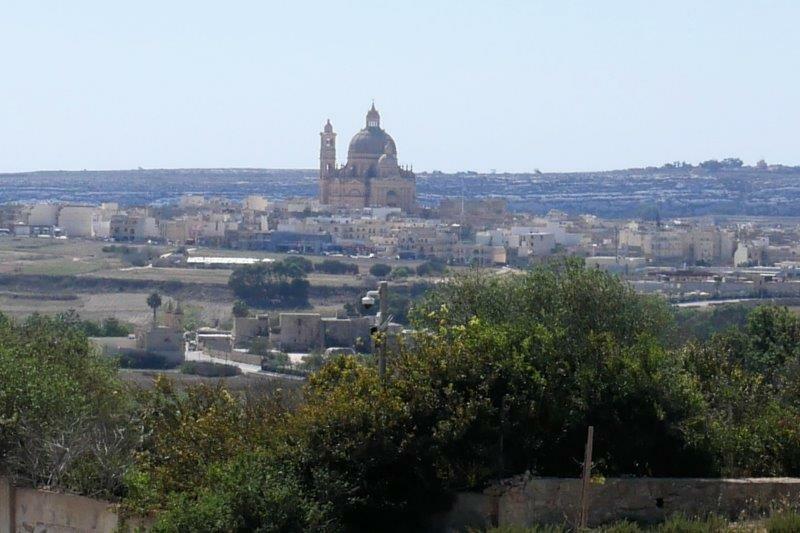 We spent 8 days in Melleiha on the west end of Malta. It’s a “real” town – only 3 things listed in Lonely Planet to see and very quiet at night. We met 2 Americans who live there when we were in Scotland last year at the Whiskey Experience in Edinburgh and enjoyed two dinners with them in Malta. Sorry – no pictures! 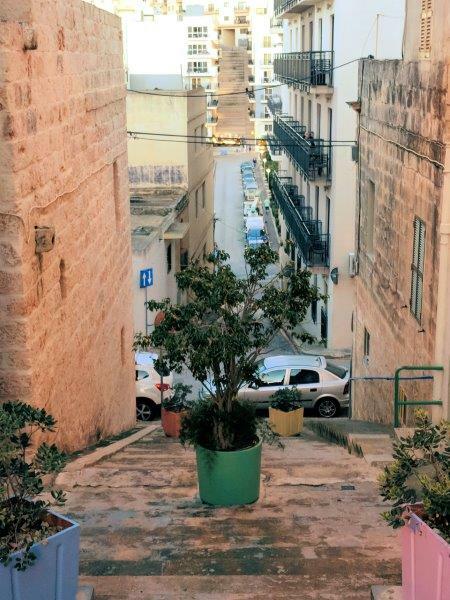 They’ve lived in Malta for 3 years so gave us the scoop on what it’s like – inexpensive services and health insurance, inexpensive food, lots of hills to walk, traffic if you choose the wrong time of day to drive …. Malta was heavily bombed during WWII by both the Italians and Germans. They dug air raid shelters all through the islands. This one can be visited in Melleiha. It was damp and chilly and very small. 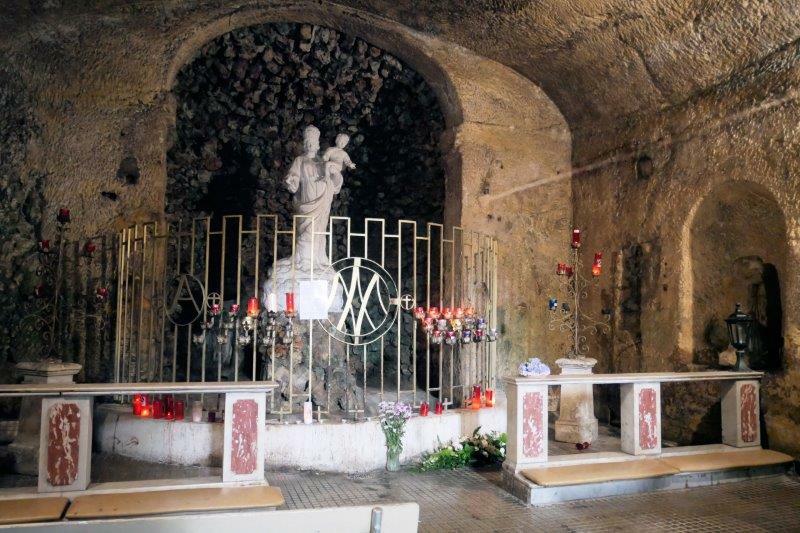 This is the Grotto of the Madonna. It was at the BOTTOM of 80+ steps. The parish church in Melleiha. One day we had a beer at the restaurant next to the church with all the old men waiting for their wives to finish up with Mass. 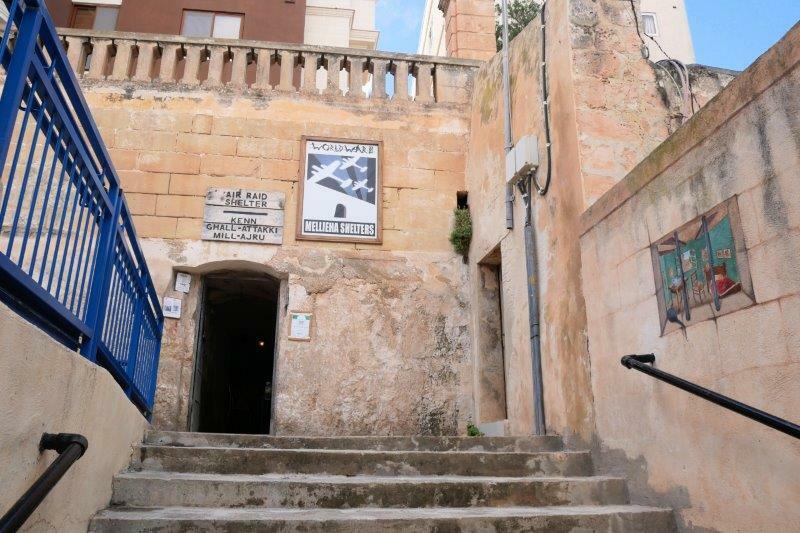 We learned that the 2 parties in Malta each own a “club” on this street where you can buy a beer or wine. Tourists are welcome. If you stand in exactly the right place, you see this piece of art. If you walk down the steps from the top, the art piece is a random collection of paintings on the steps and walls that look like graffiti, but from the bottom it’s lovely. 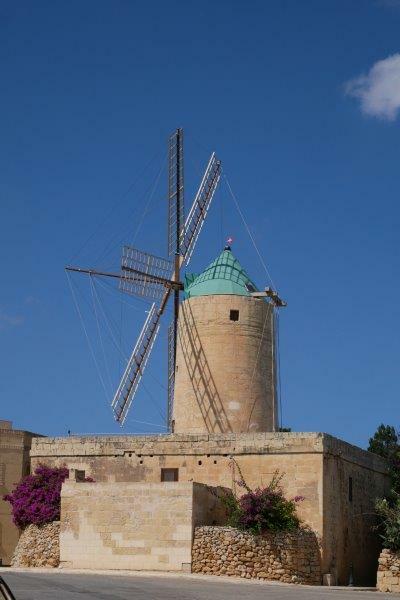 The hills surprised us in Malta – they are everywhere! Melleiha has hills and steps connecting different streets on the hills. One day we walked up 43 flights and down 47 flights, according to our Garmins. After a little arithmetic and geometry, we figured out one block we walked has about a 13% grade. If Malta residents don’t have great legs, I’m not sure why! 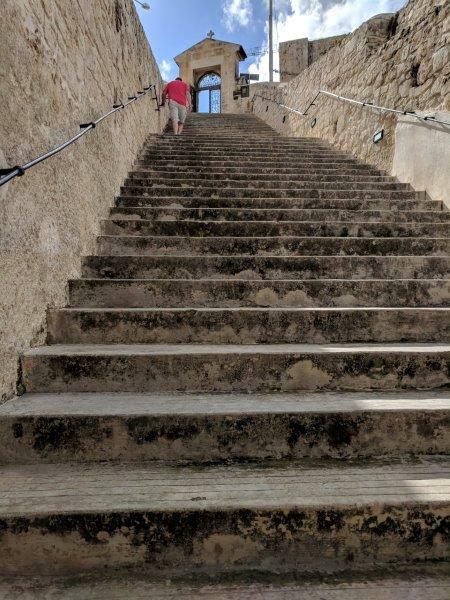 These are the 80 steps down and, hence, back up from the Grotto . Yes, we counted them! This is the view of the Mediterranean from our Airbnb. You can see how many buildings are clearly DOWN from our apartment. Malta is fairly cheap as far as Europe goes, including the wine they produce and import. We tried some Malta wine – 4 Euro for a bottle and it was perfectly drinkable. 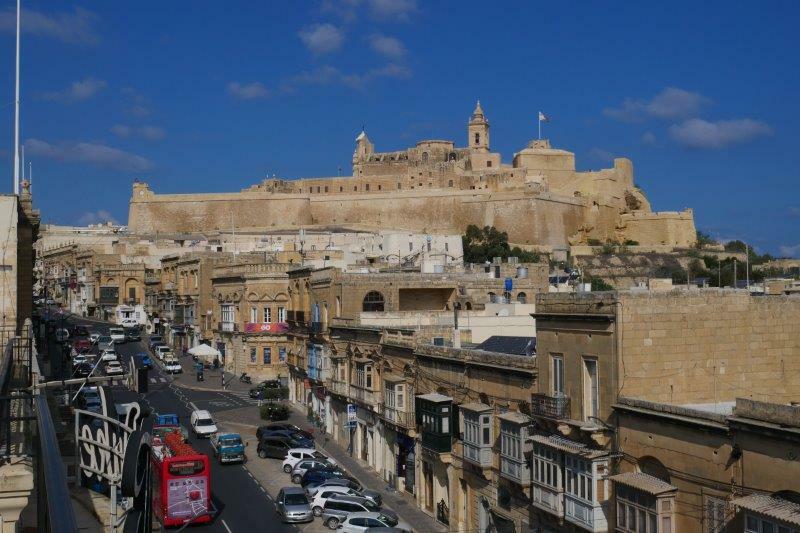 The bus system covers the island pretty well and we used the bus to get from Melleiha to the capital city of Valletta one day and visit . Valletta is a port city with lots of cruise ships stopping. The day we went, three cruise ships were in port, crowding everywhere! One recommendation (We clearly didn’t do it.) is check what cruise ships are around if you’re going to a port! Inside of St. Paul’s Church of the Shipwreck. 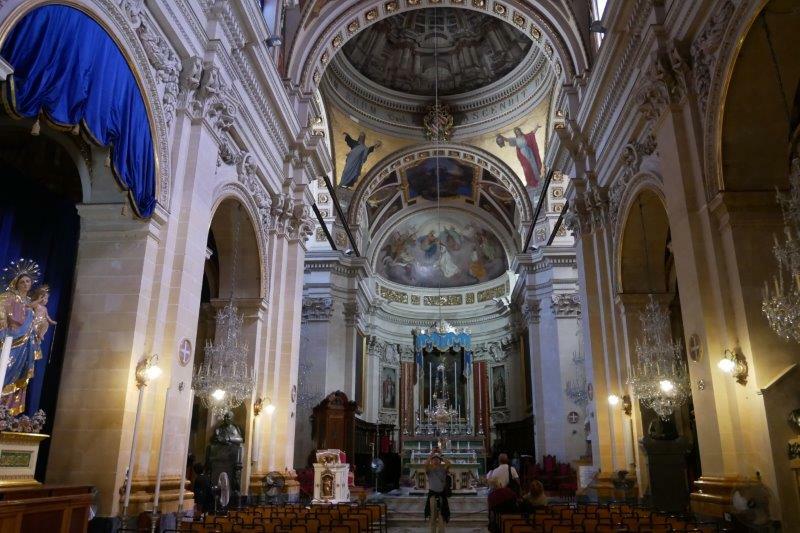 This was just one of 3 or 4 churches we checked out in Valletta – all Catholic. We ended up walking along the port where the cruise ships dock. 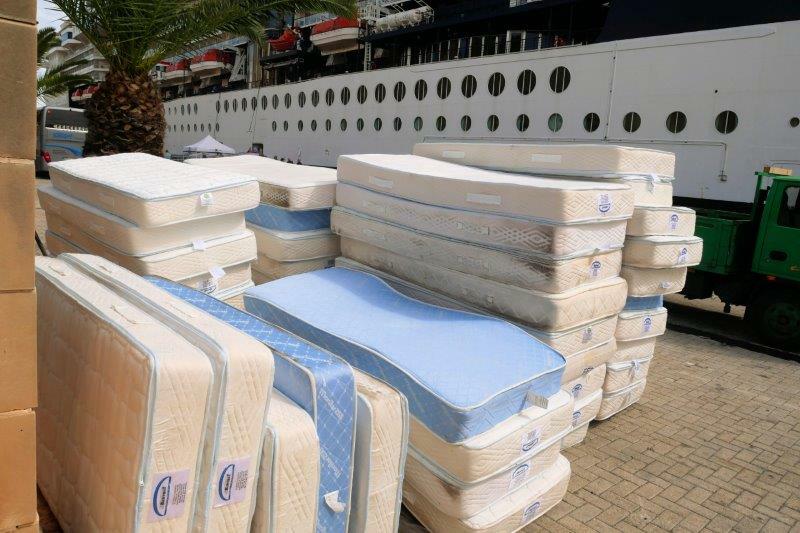 That’s where we discovered where old cruise ship mattresses go to die. 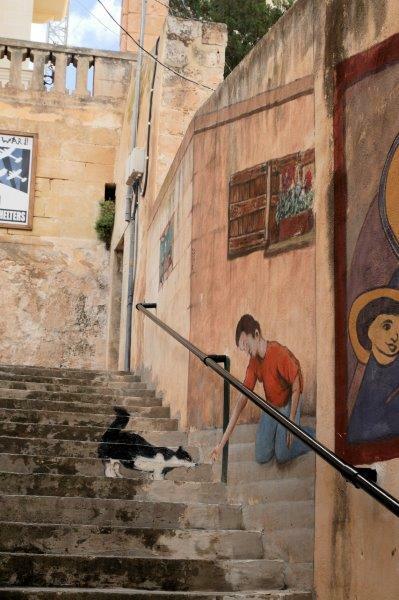 Another day we took the bus to Mdina, a walled city next to Rabat. This bus ride took an hour with stops, narrow roads and streets, hills, and traffic to go 11 km. It’s a beautiful city, though, after we finally arrived. 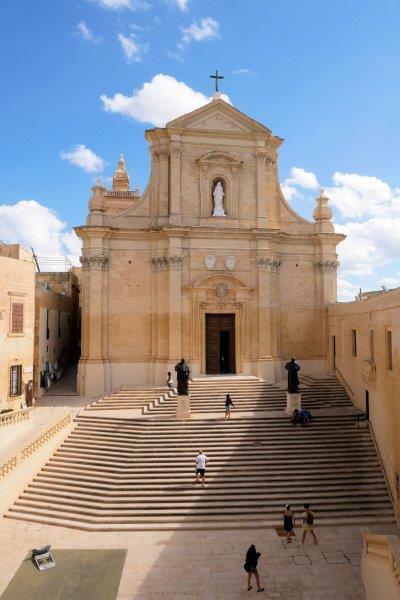 St. Peter’s and Paul’s Church in Mdina. We passed on paying 5 euro each to visit this one. 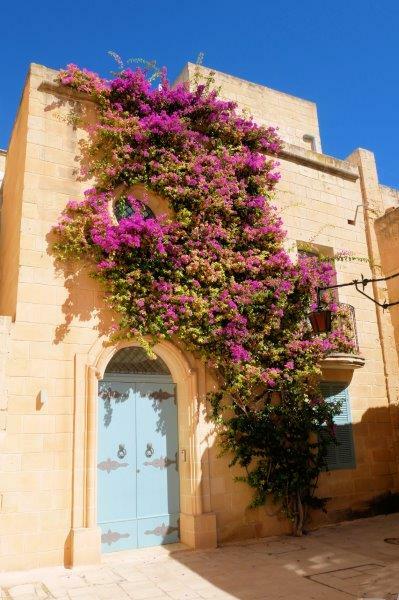 An example of the architecture in Mdina with a few colorful flowers thrown in . 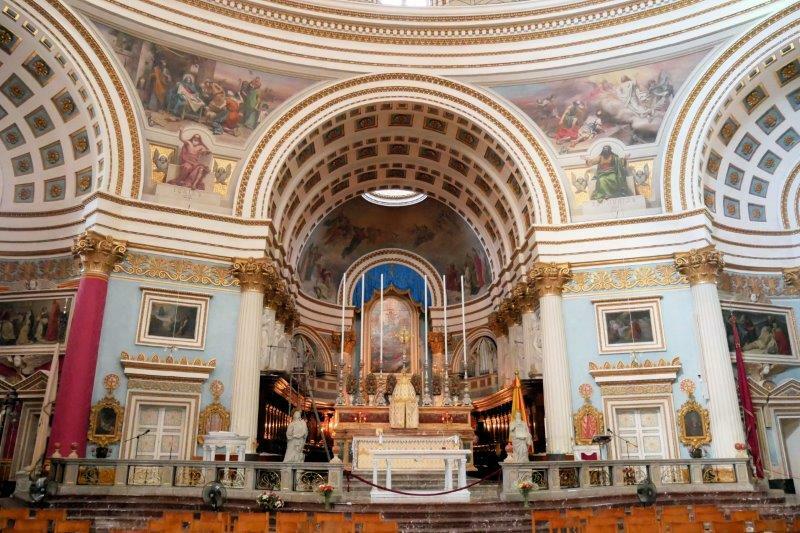 On the way back from Mdina to Melleiha on the bus, we made a 20 minute stop to see the Rotunda Church in Mosta since we’d ridden past it on the bus at least 4 times. It’s round and is copied from the Pantheon in Rome. 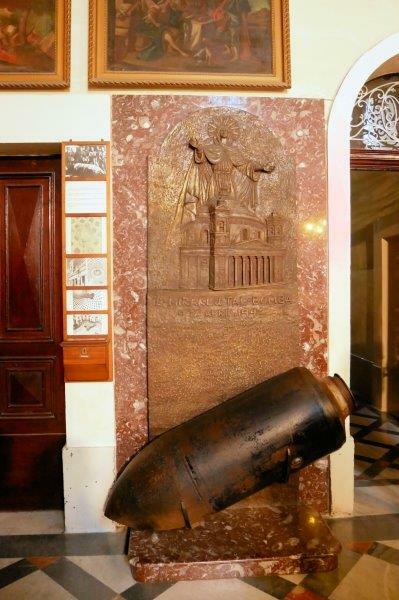 This WWII bomb landed in the Mosta Church as people waited for Mass to start. 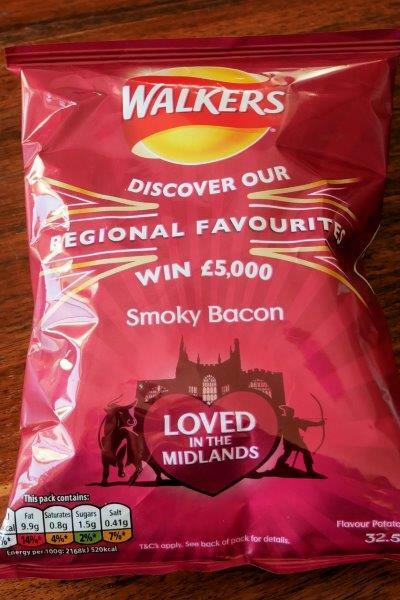 By some miracle, it didn’t go off and they have it on display in the church. 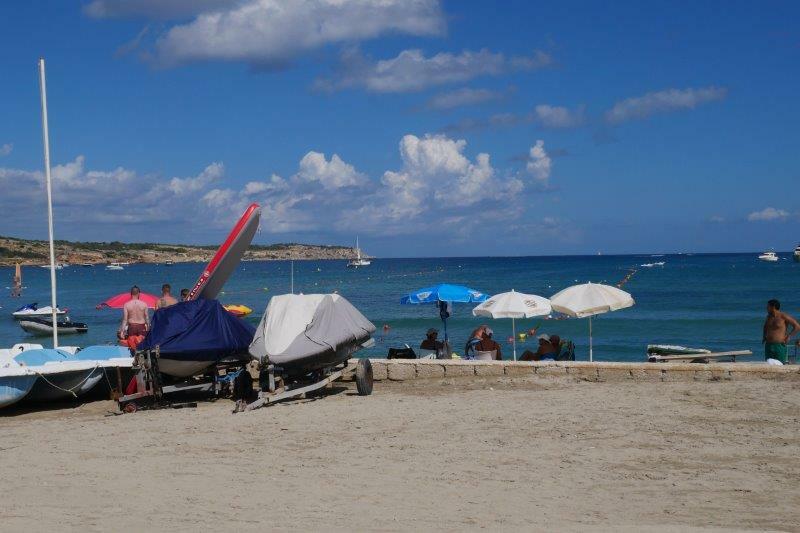 Sunday, we went to the Melleiha Beach along with the locals and had lunch on the beach. 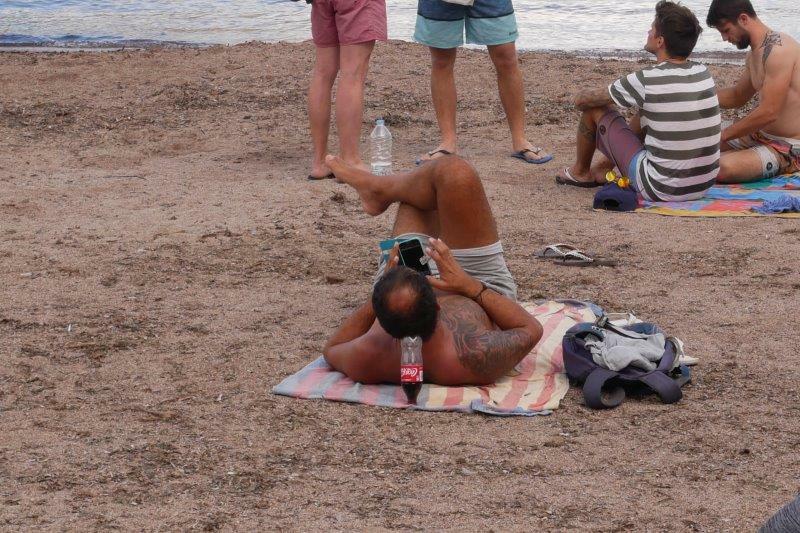 This guy uses a coke bottle to prop his head up so he can see his cell phone. Ghadira Bay at the bottom of the hill from Melleiha. It’s reportedly the favorite beach for families. Lots of Brits come to Malta or live on Malta. The sun was shining this day and lots of the Brits forgot to put on the sunscreen. 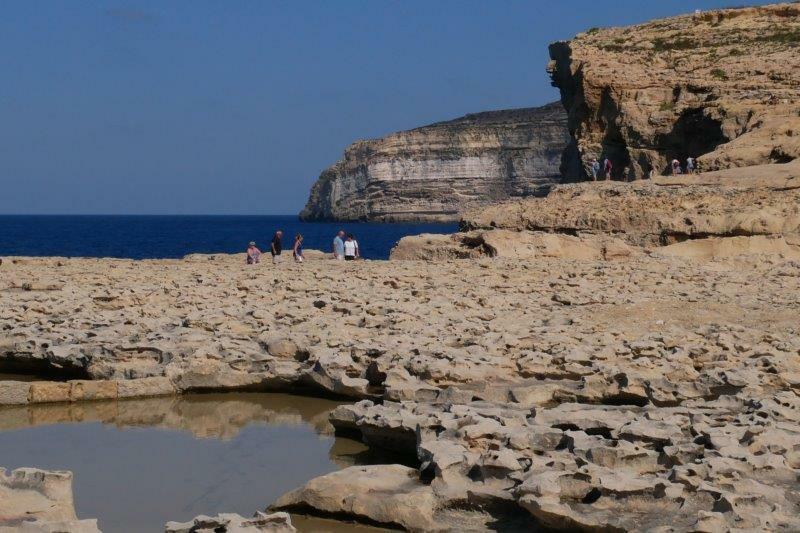 Before you even ask, Gozo is an island in the country of Malta. 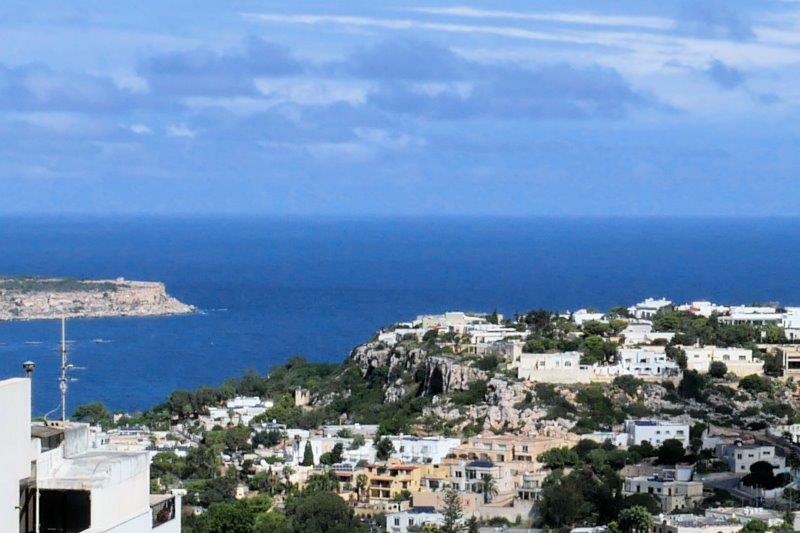 Malta is in the Mediterranean Sea near Sicily (roughly 100 miles) and only 241 miles from Tunis, Tunisia. Malta is a member of the EU and uses the Euro. It’s been on our list to visit for a bit and when we met two Americans who live here (You meet the most interesting people tasting Scotch last December in Edinburgh), we decided to come see the country. 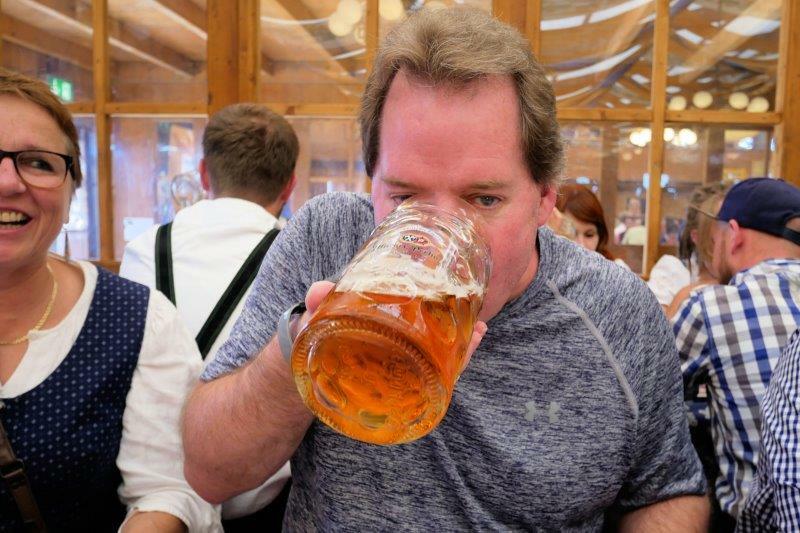 First we had to get here the day after we went to Oktoberfest! Thank heavens for Star Alliance Gold! The Munich Airport was a disaster at 10 AM with LONG lines snaking through the terminal to check in/drop bags (the longest lines we’ve ever seen in Munich by far) and then go through security. Since Lufthansa checks in Air Malta (the airline we flew), Mark said “Let’s use our United Gold card and go to Star Alliance First Class/Gold line”. 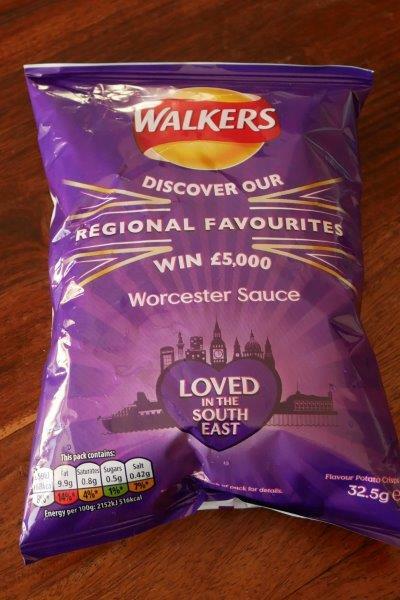 I KNEW those mileage runs would come in handy! That line had about 6 people in it. 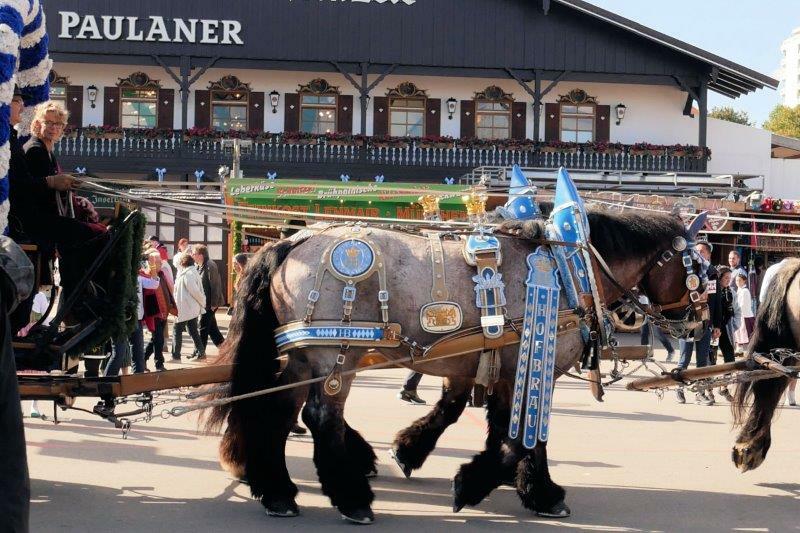 The Lufthansa check-in lady said Oktoberfest always makes the airport busy and next week (Wednesday) is a Public Holiday – Reunification Day – so lots of people took Monday and Tuesday off to go with Wednesday. We touched down in Malta almost on time but getting to Gozo involves a drive to the ferry port, ride the ferry for 20 minutes to Gozo, and another drive to Victoria where our hotel was. The taxi drive from the Malta airport to the ferry took about an hour – tons of Friday afternoon traffic on not very big roads. 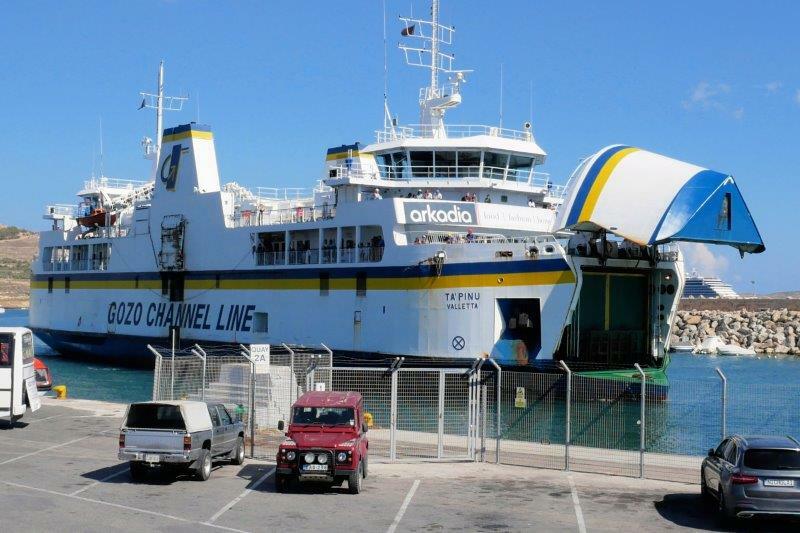 This ferry runs between Gozo and Malta with cars, trucks and people on it. The whole ride takes about 20 minutes. 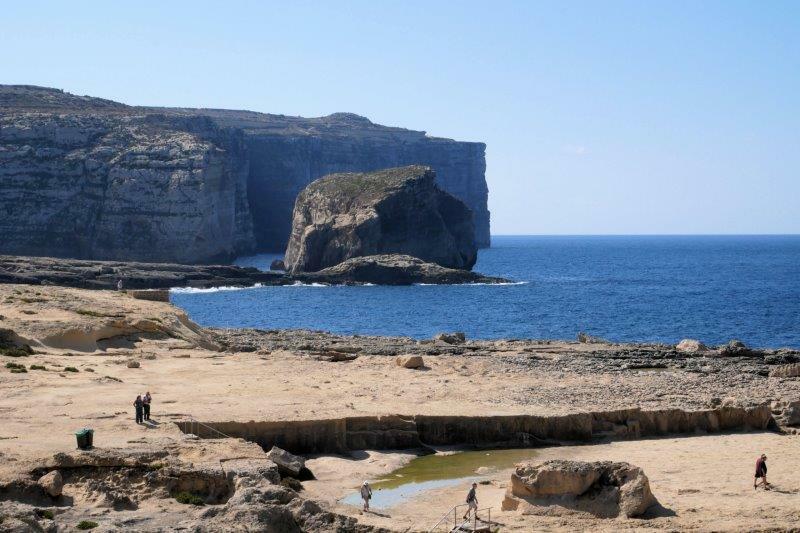 The ferry ride from Malta to Gozo is free – you pay on the way back! We took a cab from there to the Duke Hotel in Victoria. Gozo traffic was pretty bad but it was Friday and there’s only one road from the ferry port to Victoria. 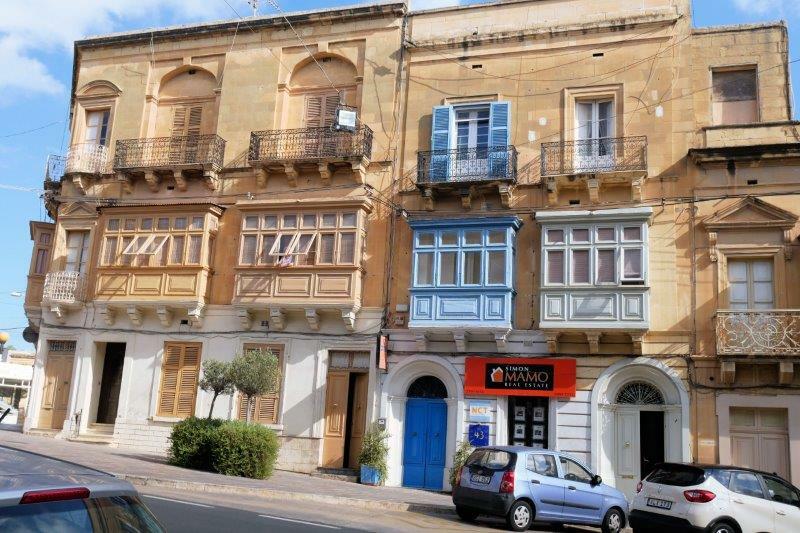 Gozo is pretty small (about 9 miles by 4 miles) with a collection of 2 lane roads, narrow city streets, and parking on 2 sides of the main city streets. 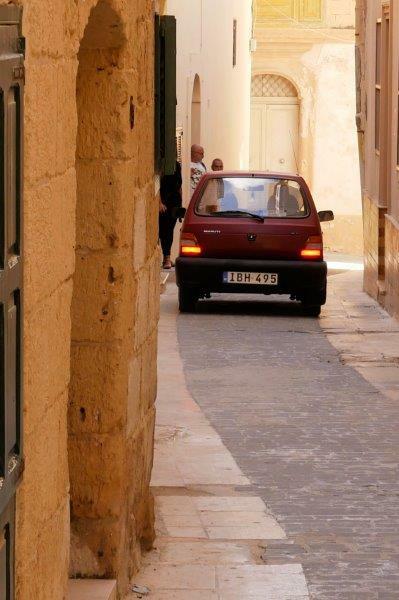 Don’t forget .. Malta was British for so long that they drive on the left side of the road. That car really did belong on the street. We watched some interesting driving and parking! 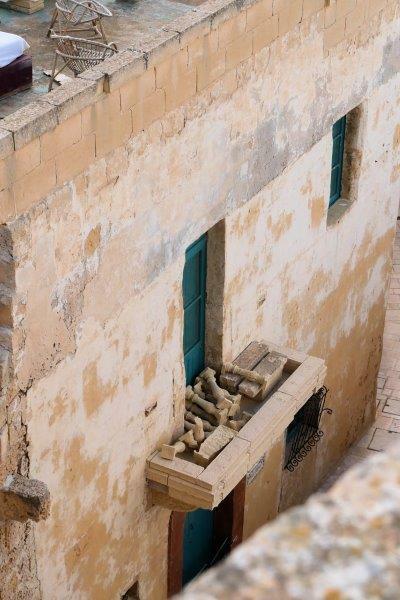 Maltese balconies. These are all over the place painted in different colors. Another view of the Citadella from Victoria. You can see how big the Main road is …or is not! One day we walked up to the Citadella, built in the 15th century and reinforced and added to over the years. There’s also a Cathedral in the middle of it. It was hard to get any good pictures of the castle up close. 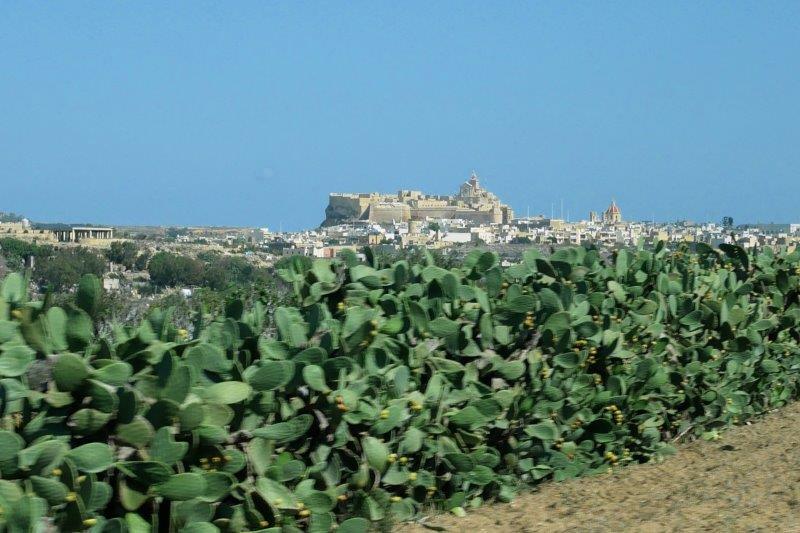 The Citadella in Victoria looms over the entire island. That’s a hedge of prickly pear cactus. Looks like they left a few spare architectural pieces laying around. 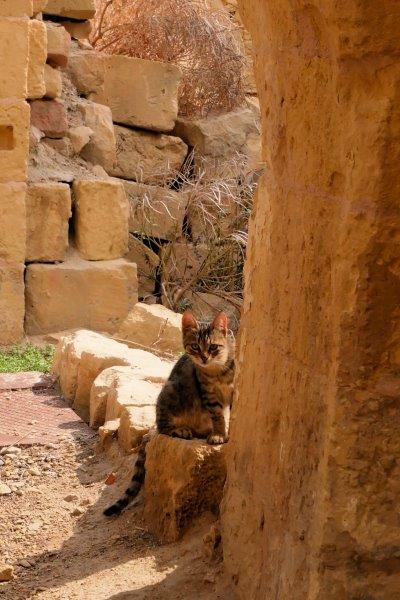 We found this Malta cat staring at us in the Citadella. This ceiling is really flat. There was not enough money to pay for the dome so the builders used a technique to make it look as if there’s a dome. Another day was Hop On Hop Off bus day! Little did we know a Holland America cruise was in port and lots of those passengers opted to take the sightseeing bus. The bus was packed when we got on and most of the people, we think, just stayed on and rode around the island without ever getting off. The bus went through Victoria on the way to Dwerja where we got off to wander around the rocks and see the sights for 45 minutes, use the toilet and buy 2 postcards. 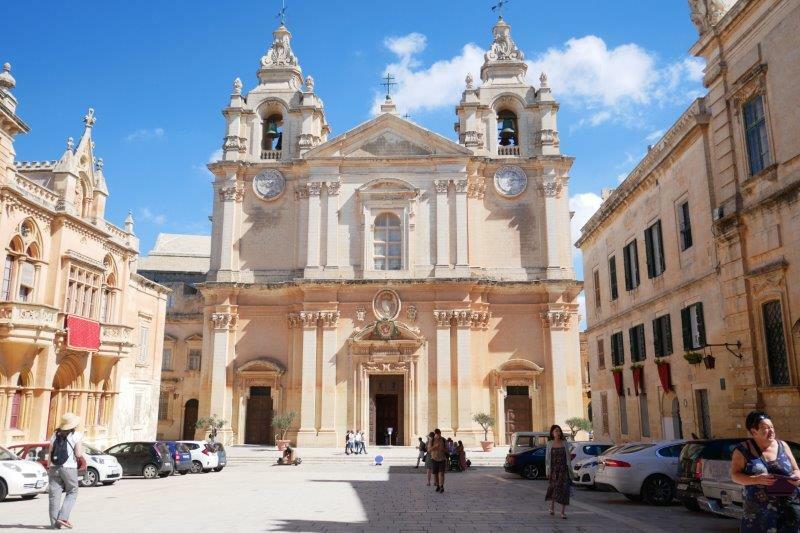 Back on the bus to drive past Ta Pinu (large cathedral), Fontina, Xlendi (beach town near Victoria), Marsalforn (beach town). Dwerja Cliffs and rocks. Lots of people were diving or snorkeling off this coast. We started looking for megaliths when we lived in Portugal. 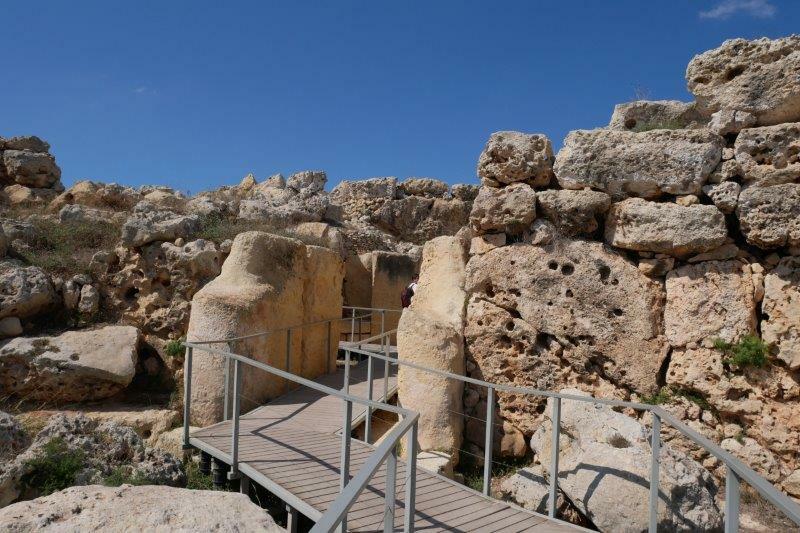 The Ggantija megaliths in Gozo are well-organized and easy to find with a good visitor’s center in the sleepy town of Xaghro. I didn’t have to drag Mark on any dirt country roads in this trip! 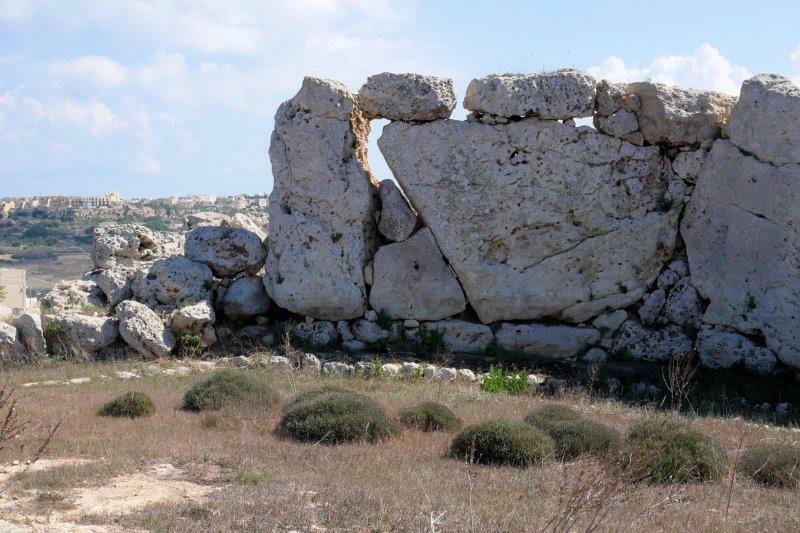 These megaliths are literally on the main road and quite easy to get to. When the bus finally showed up again, we rode it past Ramla and Nadur to Mgarr, the ferry port, where we lost most of the other people on the bus. 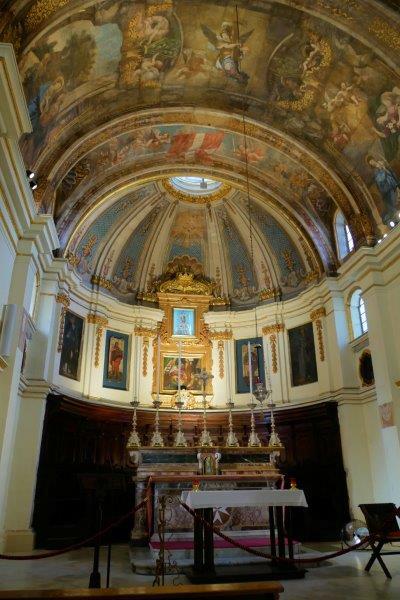 When we arrived at the Rotunda Church, the driver told us we could have 5 minutes to go in the church since the next stop is closed on Sunday and he has to wait at the church, anyway, to stay on schedule. 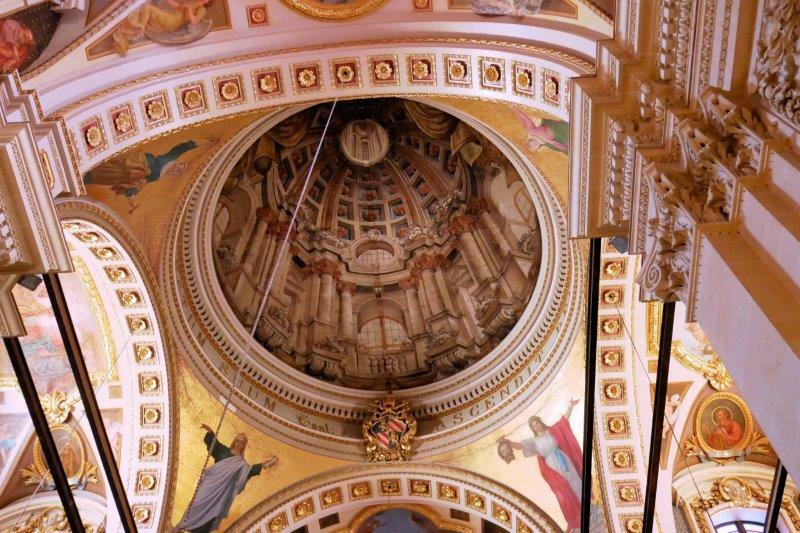 We checked out Rotunda of John the Baptist, 4th largest rotunda in Europe, depending who’s doing the calculations! 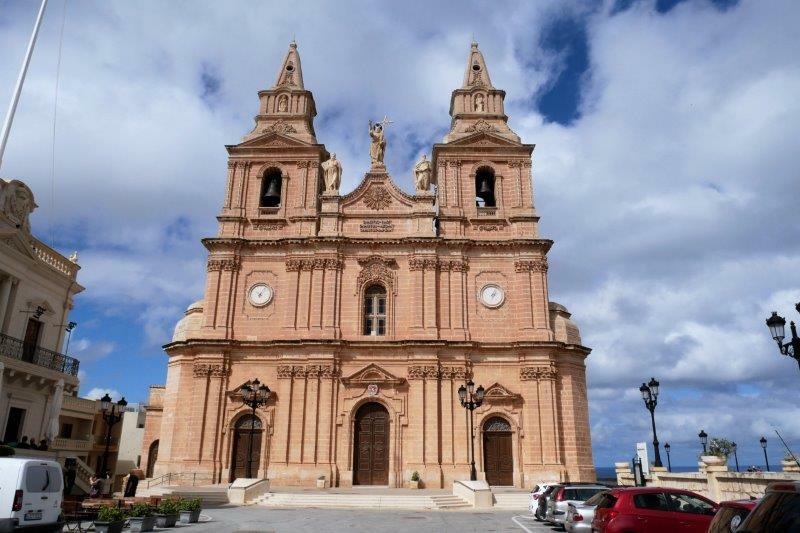 Church of St. John the Baptist standing above Xewtija. I had to take the picture from a moving bus! Best sight of the day … worker at the port trying to get a group organized for a speedboat ferry. He finally said, “OMG” and then blessed himself! To reserve a table, you have to reserve the full table of 10. The reservations are free but you have to buy coupons for 2 beers and a chicken for each of 10 people. We were at the Pshorr Braurosl. 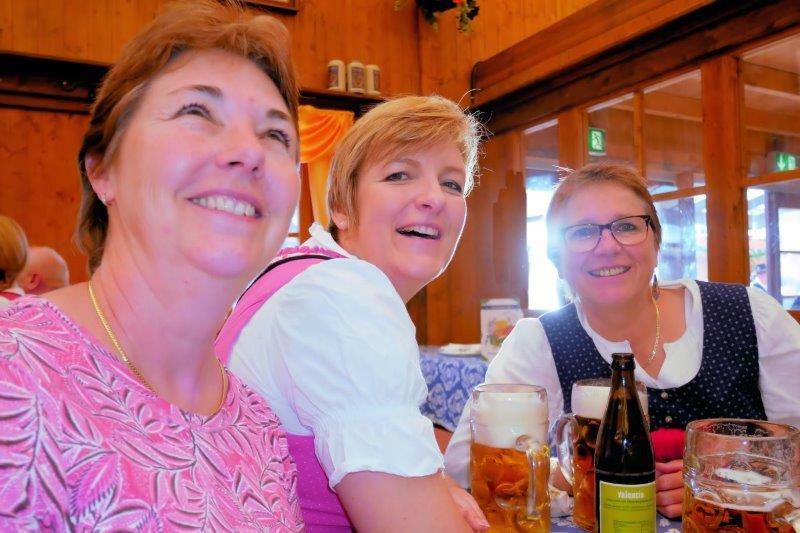 Besides us and Jutta, Bettina and Michelle came down from Heidelberg, making 5 at the table. Four “students” joined us from Cal State – Fullerton. The “students” are not students any more. They’ve all graduated and pay their own bills. One has a Mom who works at Fullerton with exchange programs which is where the connection comes in. I think they had fun! They danced on the benches, anyway, and enjoyed the chicken and drank the beer. We’ve already made a reservation at Hotel Uhland for next year for 3 nights. (It’s cancellable.) We love this hotel! Susan stayed there in 1982 on a trip to Munich. 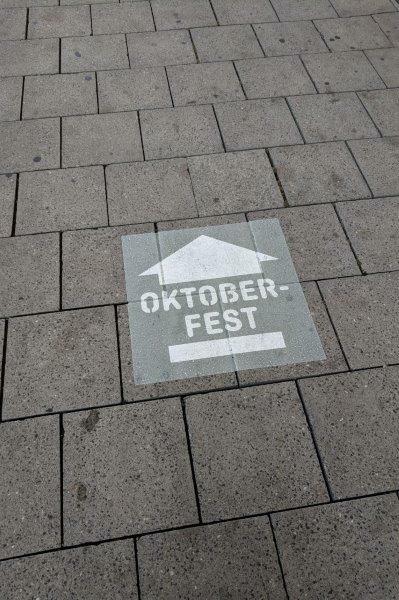 It’s about 2 blocks to the Oktoberfest entrance, nice people, good breakfast, and a dog to pet. This year we met Eddie, a big fluffy dog who leans to get more pets. 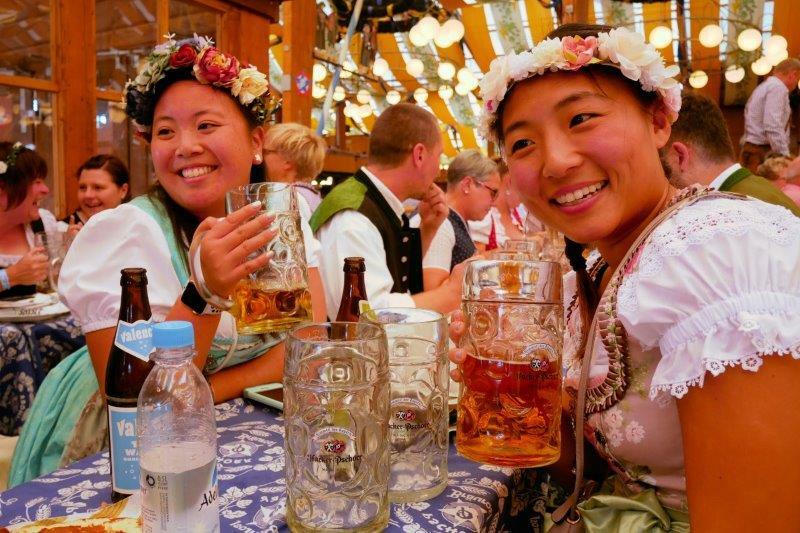 The ladies from Fullerton rented dirndls for the event and the guys with them rented liederhosen. None of us knew you could rent the clothes. 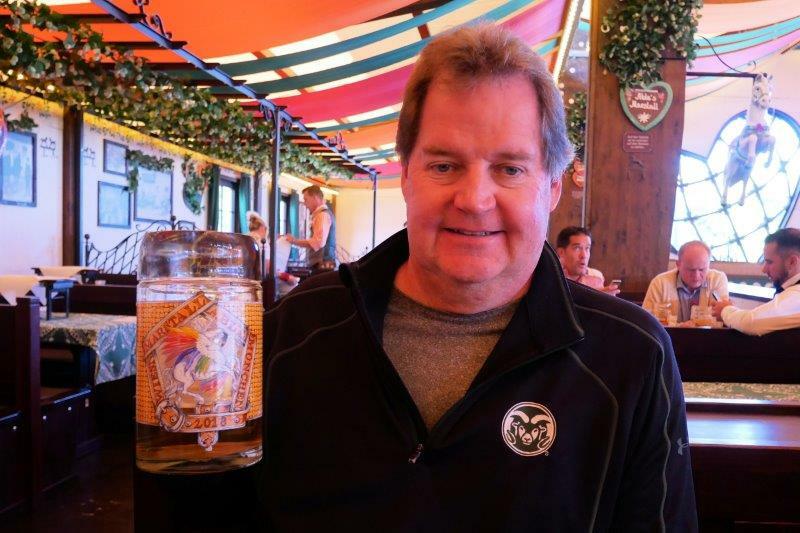 One night we ended up at the Hofbrau tables outside and it was cold! We sat near the heaters but I wasn’t taking off my coat. 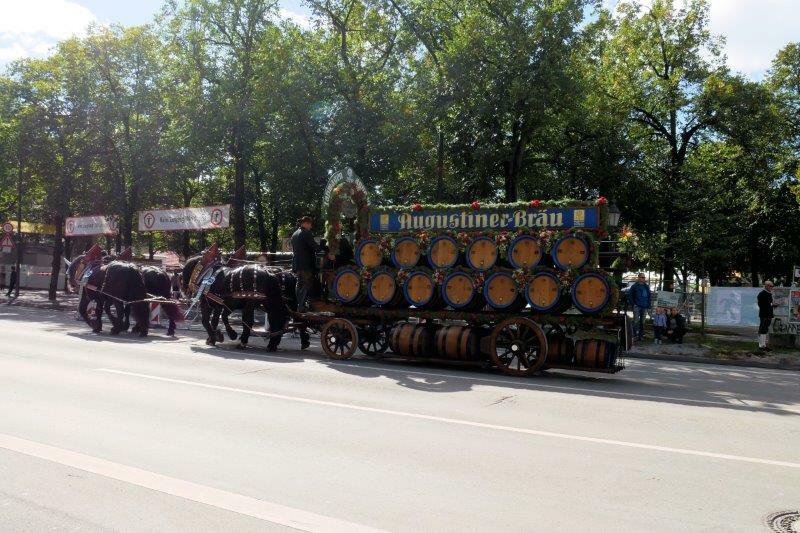 This is the Augustiner wagon near the grounds. 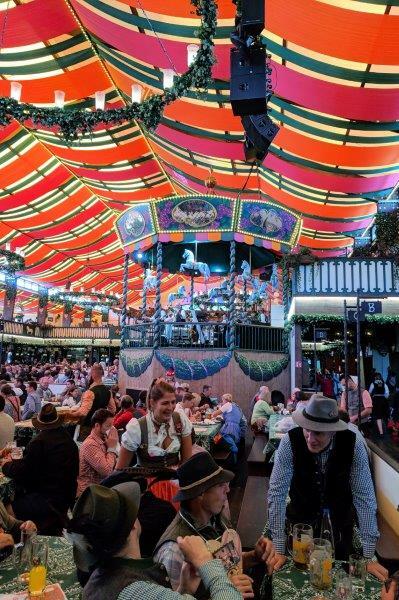 If you’re interested in going to Oktoberfest, think about going the first week before it gets crazy; avoid weekends, and book a table for an afternoon session which is 11:30 – 4:30. Afternoons are way calmer and much quieter. Of course, it helps to have a German speaking person to try to get a table. If there aren’t many people in your group, you can usually find some seats by just walking in. We (2 of us) had no trouble finding seats at Marstall tent one afternoon. 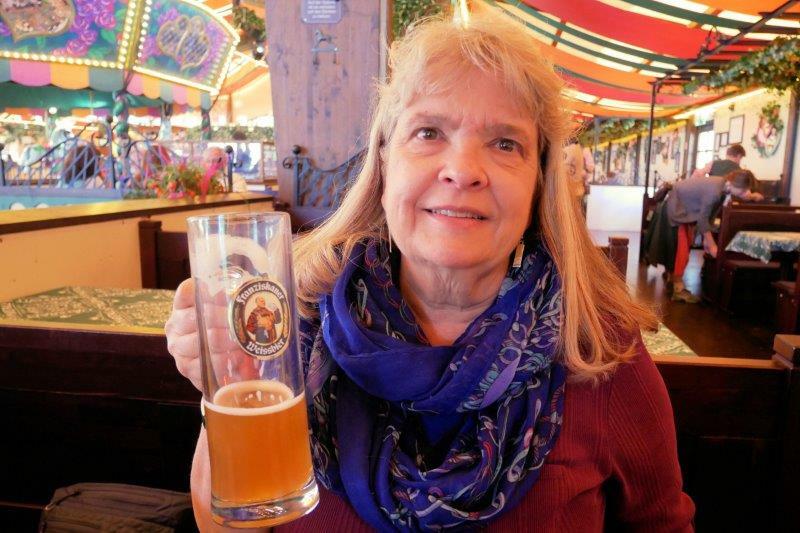 Susan enjoying a wheat beer. Mark at Marstall tent. It’s the newest tent on the grounds and has a horse theme. After the tent and beer, it was game and ride time! 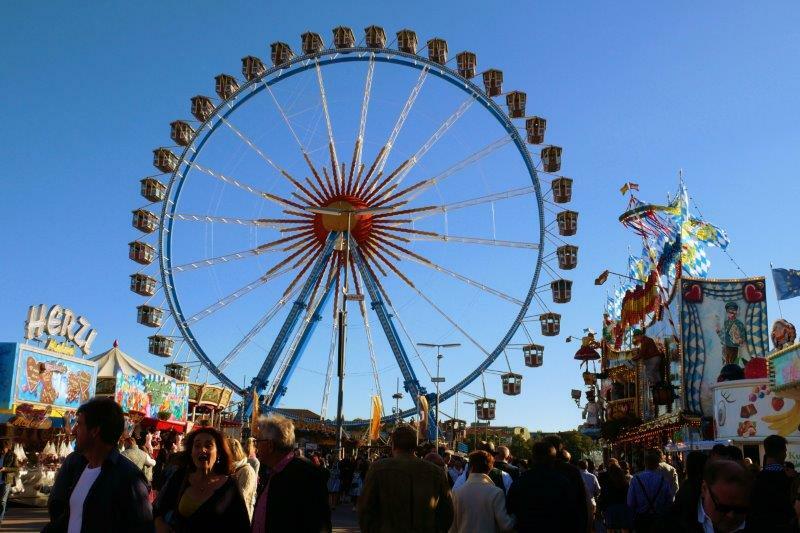 Oktoberfest is like a REALLY big fair with lots of rides, including upside down, spinning rides. 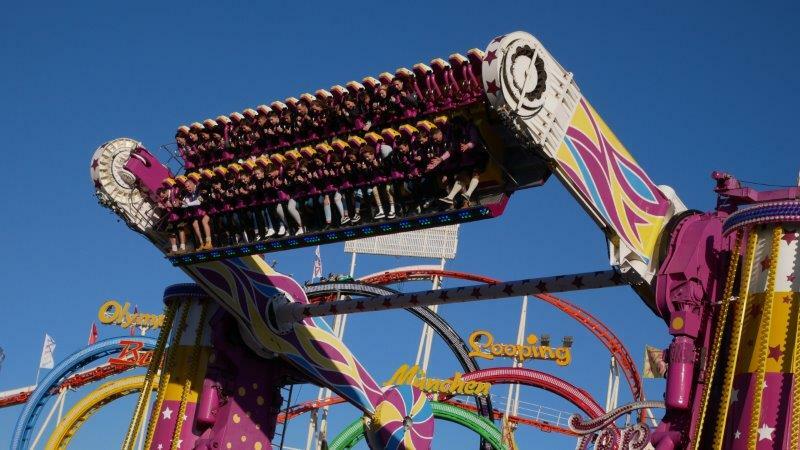 Why anyone wants to ride the upside-down ones after a beer or two is beyond me. Mark rode two rides with Bettina and Jutta, Mark and Susan rode a small roller coaster. We did NOT ride this one. This car spins upside down while the whole ride goes around in circles like a ferris wheel. The ferris wheel is one of the tame rides. Mark and Bettina on a ride after the beer. 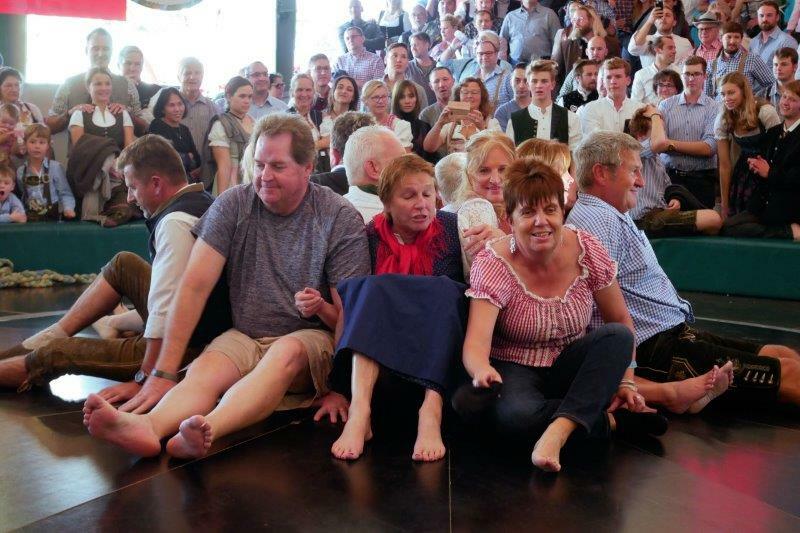 It’s an old German ride with the goal to be the last person sliding off by resisting centrifugal force. 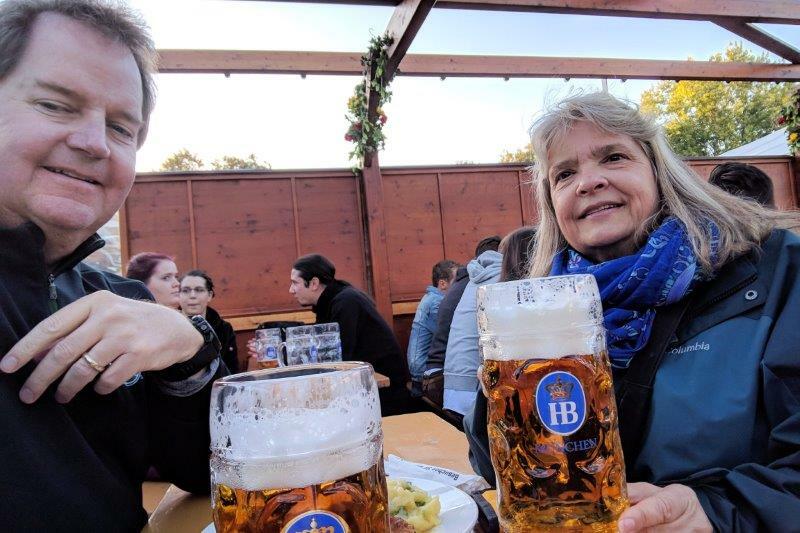 Mark and I did some sightseeing in Munich before Oktoberfest. The weather was perfect with clear blue skies! 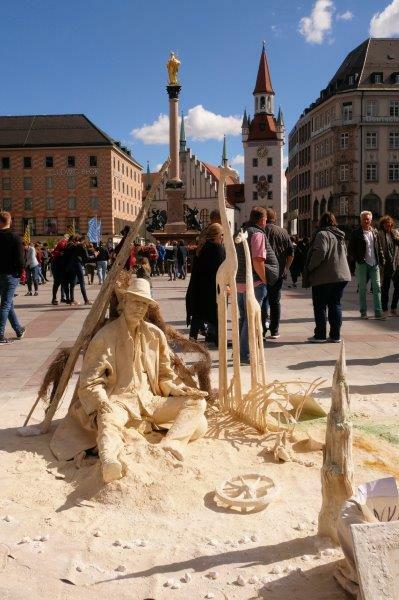 This guy was in Marienplatz as a street performer. On the way back to the Hotel Uhland, Mark asked two guys if they needed directions since the guys stopped at a corner to discuss the map on their phone. 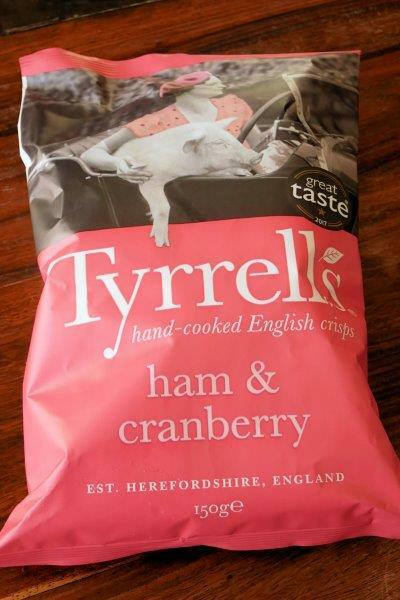 One guy said “This is good. We have an American guy telling two German guys how to find Oktoberfest!” Yes, they needed directions at the messy intersection. These signs were stuck on the sidewalks leading from the train station pointing people in the correct direction. At the end of the day, it’s easy to find the way back to the train station – follow the crowds! 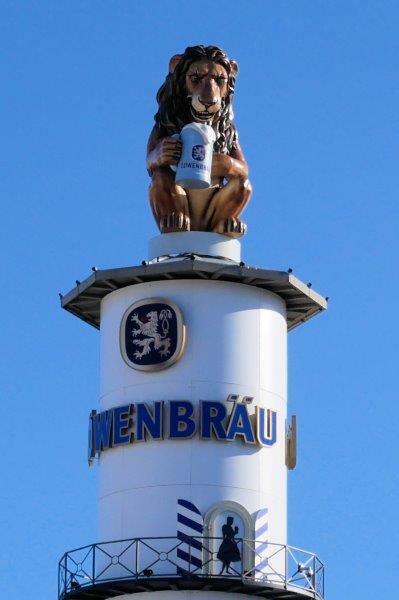 The Lowenbrau lion rotates around on top of the tent. You can see how perfect the weather was during the day.